Under the new guidelines issued by the American Medical Association, roughly 1/3 of all adults should consider taking cholesterol-lowering statin drugs to control their cholesterol levels. Many healthcare practitioners feel that statin medications are overused in the United States. Statins may cause serious side effects, which I'll get to in a bit. Also, 50% of people who die suddenly from heart attacks do not have high cholesterol. 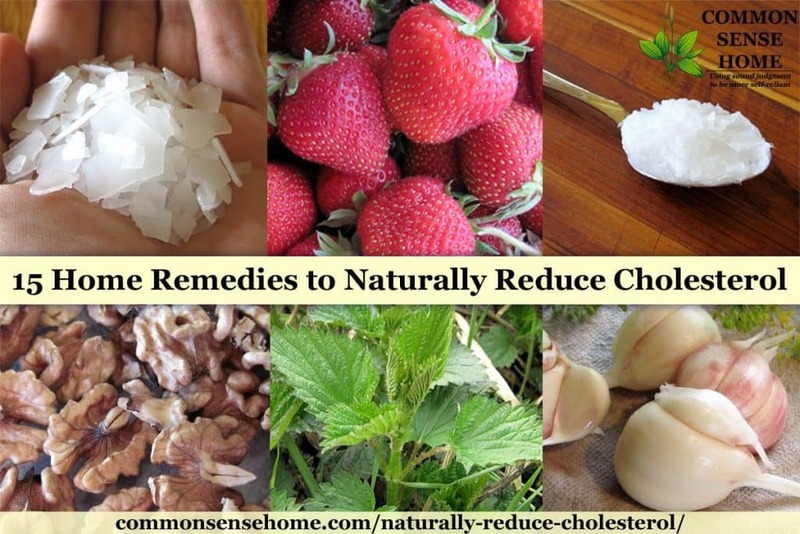 In this post we'll discuss 15 home remedies to naturally reduce cholesterol and lower the risk of heart attack, the role of cholesterol in the body and side effects of statin medication. Note: Please check with your doctor if you are on any prescription medications. Some foods and supplements may interfere with certain medications. This post is for general information only. In The Magnesium Miracle, Dr. Carolyn Dean explains how magnesium acts as a natural statin, limiting cholesterol production so that it covers necessary functions but is not produced in excess. Foods that are high in magnesium include: kelp, wheat bran, wheat germ, almonds, cashews, molasses, brewer's yeast, buckwheat, brazil nuts, dulse, filberts, peanuts, wheat grain, millet, pecans, English walnuts, rye, tofu and dark chocolate. Many wild plants are also high in magnesium, such as burdock root, dandelion, chickweed and nettle. It may be difficult for people to get enough magnesium through diet, so applying magnesium oil topically can also be helpful. Catechin, a major constituent of green tea, has been shown to reduce oxidized (damaged) low-density lipoprotein. In a 2007 study, volunteers consumed the equivalent of 6 to 7 cups of green tea daily and experienced a significant change in plasma LDL concentration. These Jasmine Green Tea Dragon Pearls make tea time a little more special. In the book Vitamin K2 and the Calcium Paradox, the author explains how vitamin K2 packs a one-two punch when it comes to heart disease. While K2 can lower serum cholesterol, more importantly, K2 reduces atherosclerois, i.e. plaque accumulation in the arteries. This plaque is the deposits of calcium, fatty substances and scar tissue that together cause “hardening of the arteries”. With plaque build up, the arteries either clog up and reduce or stop blood flow entirely, or get fragile and have a blow out. Vitamin K2 is not the same as vitamin K1, which is abundant in leafy greens and great for bone building. Vitamin K2 works in concert with calcium and vitamin D, making sure the calcium gets where it's needed – in your bones, not your muscles and arteries. In addition, vitamin K2 can remove calcium buildup in the arteries after it has formed and help restore arterial flexibility. The best source of vitamin K2 is natto, a fermented soybean concoction with a stringy, slimy texture. Other sources of vitamin K2 include goose liver pate, hard cheeses (such as gouda), soft cheeses (such as Brie), egg yolk, butter and chicken liver. Most people in the US are low in vitamin K2, although regular cheese eaters tend to far better than the general population. You can also buy a K2 supplement made from natto. As the much publicized commercials for popular cereal brands note, the soluble fiber in oats helps to lower total and LDL cholesterol levels. Go ahead and enjoy a nice warn bowl of oatmeal (soak overnight for quick morning cooking and easier digestion) or sneak some oatmeal into your snacking with fun recipes such as these cranberry-walnut powerballs. Hypothyroidism (under active thyroid) often correlates with high cholesterol levels. Talk to your health care provider about checking your thyroid. Improving thyroid function may help to naturally reduce cholesterol levels. See How To Heal Thyroid With Foods – Nourish and Detoxify. University of Minnesota Researchers studied more than 400 people for 10 years and found that cat owners had their risk of heart attack reduced by 30%. Of course, this tip would probably not be helpful if you are a cat hater like my father-in-law. This may be related to a cat's ability to purr. A recent study concluded that “blueberry intake acutely improves vascular function in healthy men in a time- and dose-dependent manner”. Blueberries are high in anti-oxidants, which reduce inflammation. Learn how to grow your own blueberries. My grandmother Catherine always loved to say, “an apple a day keeps the doctor away”. It turns out she was probably right. A 2011 study by researchers from Florida State University found that older women who ate apples every day reduced LDL cholesterol levels by 23% within six months and increased HDL cholesterol levels by 4%. The apple eating women also lost an average of 3.3 pounds. In a 2011 study, woman consuming about 2 tablespoons of coconut oil per day experienced increased levels of HDL, decreased LDL/HDL ratio and reduced waist circumferences. For a sweet treat that includes coconut oil, cocoa (for magnesium) and walnuts, check out our No Cook Coconut Oil Fudge recipe. A study published in January 2012 analyzed 26 clinical trials and found that garlic was more effective than a placebo in reducing cholesterol levels, specifically total cholesterol and triglyceride levels. Garlic did not appear to have a significant effect on HDL and LDL. Garlic is also anti-viral, antibacterial and anti-fungal, and may help lower blood pressure and improve liver function. Fresh garlic packs more punch than cooked. Learn how to grow garlic. Loaded with omega-3 fatty acids, fish oil is a nutritional powerhouse that reduces inflammation and clotting, lowers triglycerides and increases HDL cholesterol. Make sure to choose a quality brand that has been tested for mercury and other contaminants. Walnuts, like fish oil, are also high in omega-3 fatty acids. Nuts are also high in magnesium. In an unrelated note, getting a little silly to reduce stress is also very good for reducing inflammation and improving overall health. What you shouldn't eat is as important as what you should eat. The FDA has *finally* admitted that transfats are bad, after allowing them to dominate the market for years. Of course, manufacturers are likely to come up with some other modified goobledegook that is equally as nasty. When choosing fats (and other foods), look for less processed options. As the saying goes, I trust cows more than chemists, which is why I eat butter. Shop around the edges of the grocery store, and look for minimally processed items. Buy real vegetables and fruit, fresh meat and dairy. Learn to bake your own bread. You can check out our Recipes page for a wide assortment of homemade fare. Although exercise is very good for many reasons, promoting circulation and strengthening the body, it's not a magic bullet when it comes to cholesterol. Cleveland Clinic states that “Exercise has the greatest effect on triglycerides (lowers them) and HDL, the good cholesterol (increases it). Exercise does not have much impact on LDL unless combined with dietary changes and weight loss.” Start out slowly and gradually increase your activity levels. GREAT post! Sharing on Facebook right now. I would assume dogs would help as well. We had miniature schnauzers when I was a little girl and I LOVED them. Thanks, Adrienne. Actually, that study didn’t see the same correlation with dog owners, perhaps because dogs require more care (walks, attention) or maybe due to the differing personalities of dog and cat owners. Other studies have shown that dogs are very good at lifting depression and reducing anxiety, so dogs may have a less direct effect on reducing cholesterol. Kristen – That is so not true! My 2 cats follow me around most all the time. And on the rare occasion that they are out of my sights, all it takes is for me to yell “PARTY MIX!! !” and they come running for a treat. Bo biting, no scratching. lol – you should catch that with a camera and post on youtube. I agree with Laurie. Our cat is always next to us. It shows you never had a cat. My cat was the best friend and companion I ever had in my life. They are contributing it to the purring and last I checked dogs don’t purr! Maybe the cat thing is tied into their purrs? Thanks Laurie for the very well put together post! My Mom and Mother-in-law are both on cholesterol lowering drugs and I don’t think either one of them need them. My Mother-in-law is 85 years old and is in great health, will go for a 5 mile walk when the weather permits or rides a stationary bike for an hour, lifts weights and eats really well (I even got her to to start drinking Kombucha) and has no problems with her heart or blood flow. My Mom is stiff and osteoarthritic and she notices that she feels much better when she is off her Cholesterol meds. I’m going to print this off for her. Excellent and well researched article, Laurie! Statins are the biggest hoax. Without cholesterol we’d all be puddles of goo on the floor. Sharing! You’re very welcome, and have a great holiday season. I have been diagnosed with extremely high triglycerides (over 300) and my doc put me on Lipitor first, then Crestor. I had terrible muscle pain and weakness with both and did not continue with the prescription. I went for a few years before getting my lipid panel, changing the food I eat (more Paleo) and exercising more. As a result, my next lipid panel showed a whopping increase to over 600 and my doc said it was the highest she had ever seen. She recommended I change my diet and start on LiVaLo a newer statin that was not supposed to have the same side effects. After doing some research, I found that my age 63 and lack of any familial heart disease could make my high levels a non-issue. Paleo diets are also reported to increase levels as well. I would rather eat pure and healthy and feel better than revert to how I was previously. The meds are outrageously expensive also $280 for a month supply of 15 pills. That is close to 1/3 my monthly income. Totally makes no sense for me to take these meds. I’m glad more medical professionals are speaking out on this topic, and thanks for posting it here. We can all be more healthy without Big Pharma if we do some of the things on your list! Thanks for sharing your experience, Pamela. I’ve seen loved ones have terrible side effects from the medications, and I don’t wish that on anyone. Good for you for doing your research. Thanks for sharing this information, Laurie. I recently had a wellness check that showed my ldl cholesterol was slightly higher than optimal. Their recommendation was to switch to low fat foods and exercise more…exercise yes, low fat foods…not so sure. I’m going to try increasing vit c, magnesium, and some of your other suggestions (and exercise too). Thanks! My niece, who is a nurse, says that very little time is spent on nutrition, and from what I have seen from my own health care practitioner, I would agree. It takes a long time to change long held dogmas. Good luck! Thank you for this post! I’m so glad it poped up in my pinterest feed. My 12 year old has a cholesterol of 200. No mention of drugs….yet! I’m glad to have a few other more natural options to try. It was also interesting to read why we need cholesterol. Knew that had to be a reason if our bodies produce it. No way is she going on meds. Have you ever watched “My Cat from Hell”? It’s got some good tips for dealing with difficult cats and helping them learn to be the good companions we’d like them to be. One high energy cat showed up and adopted us last summer, and we’ve have to really work with him to get him to be a much more loveable fellow. I think he smacks people’s ankles as they walk by in the same way that a grumpy old man would brandish a cane at someone! It’s a really neat show. The turnaround in the cats is amazing. Miss Kitty, our older female cat, does the ankle attack sometimes, too, when she’s feeling sassy, but not too often. Laurie, Bless you for helping this kitty! I hope your doctor is open-minded. What about those who are genetically predisposed to high cholesterol? My husband has tried the diet changes to no avail. He is not overweight and gets moderate exercise. If he is otherwise healthy, I wouldn’t be overly concerned about it, as there are numerous studies that link higher cholesterol levels with longevity. You can read more at, “The Benefits of Cholesterol“. If he has other health concerns, you should work with a trained health professional. I can share general information, but it’s not safe or legal for me to give specific advice. A very interesting article. Thank you for sharing. Thank you for reading, Mary Jean, and have a wonderful 2017. 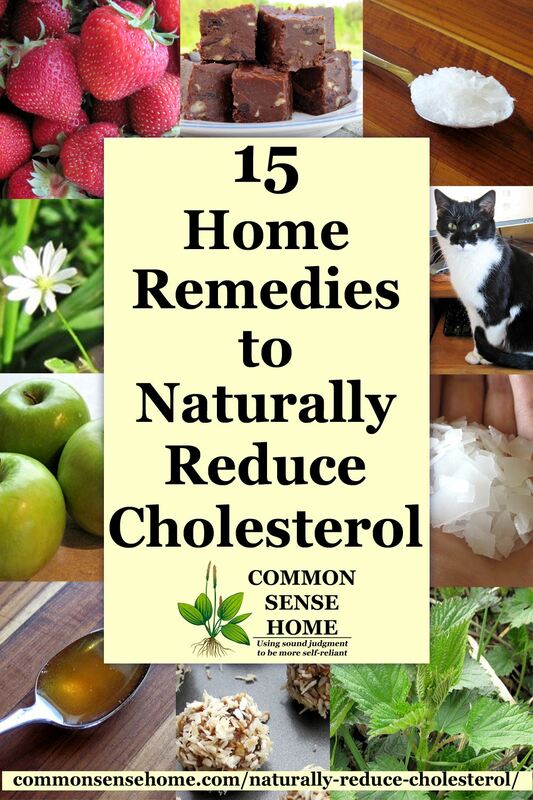 Niacin and serrapeptase will also reduce cholesterol. One of the natural, and interesting, ways to reduce the level of cholesterol is sleeping. Our bodies metabolizes cholesterol as we sleep. This is the exact reason why it is recommended to take statin drugs before we go to sleep. Those who get too little sleep or too much sleep are more prompt to have higher levels of bad cholesterol and lower levels of good cholesterol. Sleeping time intervals that are not normal are believed to interrupt the way cholesterol is metabolized by our bodies. Additional advantage of getting enough sleep intervals is that you will have more stamina to be more physically active, which will benefit your cholesterol levels. Thanks for sharing that helpful information. I use all the ones you listed and still have high cholesterol. I just found out about these two and are adding these to my diet! Dr. Oz says they work. I just ordered seeds to grow my own because their are none in the city here. I have both in my garden, although the goji berries aren’t producing yet. Good to know. Great article! I grew up in a family of skinny people slowly dying from cholesterol related illnesses. Through the 80’s, we adjusted our diet to include a plethora of “substitute” foods. Over the years, I’ve watched my dad become less and less healthy, as my grandfather and his brothers did. All take/took statins, and my brother is on his way, if he isn’t already. I’m happy to say that, even though I’m overweight, by eating real foods, including butter, eggs, and red meat (mostly venison, I’ll concede), for several decades now I don’t have any of those health issues. I firmly believe all the fake stuff we ate and the damage the statins cause (my dad is diabetic from them) has diminished their lives instead of helped. Thanks for sharing your story. I hope at some point the truth will come out about all of the fake “foods”, like people are finally starting to wake up about margarine. I like your article and will be following a lot of the suggestions you made. But I have a problems with owning a cat. For one thing I’m allergic to cat hair and most importantly, I have a german shephard. So that suggestion will NOT be followed. But will take your book to my doctor on Friday. Thanks again for this. yes, if you are allergic to cats, skipping the cat is a good idea. My doc recommended a low carb diet and I have stuck to it faithfully for about a year. My HDL is on the high side of normal( can you have too much good cholesterol?) And my LDL is ten points over the limit. I read an article stating that there is a subset of people whose lipids don’t respond to a low carb diet. I will continue this diet for other reasons, but will also try your suggestions. Thanks! Please keep in mind that I am not a doctor, just someone who does a lot of research. Generally speaking, I think the push to put people on cholesterol lowering medications is a really bad idea. Cholesterol performs many critical functions in the body, including addressing inflammation. If you have elevated levels of HDL, maybe it’s trying to work on healing some sort of inflammation in the body? In your diet, have your tried eliminating common allergens to see if it makes a difference? Are you eating plenty of foods that are high in anti-oxidants, including leafy greens and other bright colored veggies, and raw foods? Do you include fermented foods to improve gut health? Have you tried adding a spore based probiotic supplement (such as Totnes’ Probiotics) to aggressively rebuild helpful bacteria in the gut (including the lower intestinal tract, where many probiotics can’t reach)? Most of us have had our gut health compromised via antibiotics, stress and other environmental toxins, so a good quality probiotic can make a big difference in overall health. Probiotics have been a big part of addressing my own health issues, and I firmly believe that they would be a benefit in many other conditions, too. At the very least, they shouldn’t hurt. I am 52, i checkd my blood and i came to know my SERUM TRIGL YCERIDE is 580 , i am planing have some herble medicine, Curry leavs ,cooking with cocount milk and rice ,like as a soup. You have any idea about this? I got this infor from local aurwedic docter in my town. Many research shows that curry leaves have properties that can help in lowering one’s blood cholesterol levels. Packed with antioxidants, curry leaves prevent the oxidation of cholesterol that forms LDL cholesterol (bad cholesterol). This in turn helps in increasing the amount of good cholesterol (HDL) and protects your body from conditions like heart disease and atherosclerosis. I’ll be 60 on Tuesday…Yay! And I’ve just been told my cholesterol is high. I don’t remember the numbers as I was in shock after my Dr. said that on the phone! I have a super food smoothie for breakfast and lunch with toast and lingon berry jam (yum). For the last year and a half. Most all of the things that are supposed to lower cholesterol I consume daily. Apparently it’s another part of being a woman this age. Again, Yay! I’m still reading a lot about it, thanks for your information! Coconut oil, is that high in cholesterol or does it help lower my numbers? I did some digging, and different sites contradict each other. Some say coconut oil will lower it, some say it will raise it. I really appreciate you taking the time to dig, I was finding the same thing. Thanks lots, glad I found you, so much information I can’t wait to read! Again, the medical profession has it wrong. Cholesterol is an IMPORTANT part of a healthy person, especially the older we get. It is, very generally speaking, the ‘grease’ that helps keep our joints working. It is also NOT the cause for heart disease! Carbohydrates consumed, antioxidant intake, smoking, weight (especially around the middle), lack of exercise, high blood pressure, and HEALTHY saturated fats, all combine to increase your risk factor of heart disease. All the above suggested ways to reduce cholesterol are great suggestions though. Carol – did you read page 2 of the article? (I broke it into two pages because it was so long, but perhaps I should go back to one.) Cholesterol is not the enemy. It is essential to life and health. Unfortunately, many people are forced by their healthcare providers or healthcare plans to try and lower their cholesterol – thus the post. I’ve been told that mine was very high Dr wanted to put me on meds but I asked if it were possible to give me a year to lower on my own I’ve read some horrible stories regarding Statins. Reading this article will help me to do so. Thank you so very kindly for your advice. Good luck. I hope you get the results you need. really great amount of FACTUAL info throughout the site, dies the C M A or Ag Can know you exist? gt ready for them to raid you if they don’t. Anyhoo the item on the walnut balls reallllly is important. throwing in the burdock weed leaves along with recipes like you put out helps keep the cholesterol and weight levels down. again lots of good ideals for solid thinking on not just for eating. I suspect we’re on some watch or another for simply encouraging people to grow their own food. My husband used to have pretty high security clearance back in the military, and I’ve had to have background checks done for entering nuke plants, so were white listed back in the day, but it’s been a while. You may find this satire piece I wrote some years ago humorous – “Homeschool Family Raided by SWAT Team for Possession of Raw Milk and Thorium Reactor“. Good recipes are always welcome. I hunted down the abstract for that study and re-linked it. The abstract doesn’t give details on dosage in terms of how many blueberries they ate, only that they consumed varying amounts of blueberry polyphenols. The “time and dose dependent manner” means that their blood work changed over time depending on the dose they were given. We observed a biphasic time-dependent increase in FMD, with significant increases at 1-2 and 6 h after consumption of blueberry polyphenols. No significant intake-dependence was observed between 766 and 1791 mg. However, at 1 h after consumption, FMD increased dose dependently to ≤766 mg total blueberry polyphenol intake, after which FMD plateaued. Increases in FMD were closely linked to increases in circulating metabolites and by decreases in neutrophil NADPH oxidase activity at 1-2 and 6 h.
Blueberry intake acutely improves vascular function in healthy men in a time- and intake-dependent manner. These benefits may be mechanistically linked to the actions of circulating phenolic metabolites on neutrophil NADPH oxidase activity. Blueberries, like most brightly colored fruits and vegetables, are high in antioxidants, which can help reduce inflammation in the body. Reduce inflammation, and blood cholesterol levels may go down because the cholesterol crew has fewer repairs to make. I THOUGHT THEY WOULD SAY *EAT A CAT* …. I haven’t seen any studies on that, but I’m certain the cats would disapprove. I hadn’t heard of this, but some online searching does show that some people use eggplant to lower cholesterol. One site places eggplant and lemon slices in a pitcher of water in the fridge and tells people to drink the water.